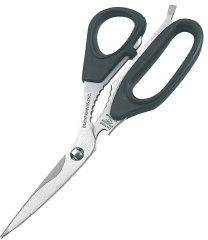 Utility shears, built tough. Easy to clean with a take apart design. Can pry open lids, open screw top containers, open bottles, cut line and use as a screwdriver. Special Features:Features Flat-head Screwdriver, Take-Apart Design, and can Open Screw-Top Containers & Bottles.